Arya has already seen two Biscuit books with Biscuit Meets the Neighbors and Biscuit and the Bunny. She liked the previous books about the cute dog, but my daughter loved Biscuit’s Pet and Play Halloween by Alyssa Satin Capucilli even more. Biscuit’s Pet and Play Halloween incorporates some of the best touch-and-feel elements that I have ever seen in a children’s board book. Biscuit’s Pet and Play Halloween follows Biscuit as he watches humans go trick-or-treating on Halloween. I would have liked to see Biscuit dressed up in a costume as well, but only the children change outfits throughout the story. Text is limited to brief dialogue between the children and Biscuit. Every page contains less than a dozen words. Simple vocabulary keeps the book appropriate for early readers, but at least one uncommon word per page necessitates a grown-ups help in reading the book. The adorable illustrations by Dan Andreasen kept my baby’s attention for the entire book. Human faces are drawn in an anime-style design with small facial features. Costumes and decorations are colorful with slightly muted tones. Biscuit, as in all his books, is drawn with a cute, quizzical expression on his face in every picture. One unique texture is incorporated on each pair of pages. Black fur, smooth silk, scratchy straw, a sparkly crown, and a rough cloth make each page interesting for young children. Capucilli specifically mentions each unique texture–although, curiously, not the last one–in the text allowing children to connect the story with the different touch-and-feel elements. Arya loved the touch-and-feel textures. Long after we read the book she was slapping and feeling the touch-and-feel spots on every page. She enjoyed the furry cat costume the best and she has trouble playing with the scratchy scarecrow costume due to its small size. But the mere presence of the touch-and-feel items makes Biscuit’s Pet and Play Halloween one of her favorite books of all time. 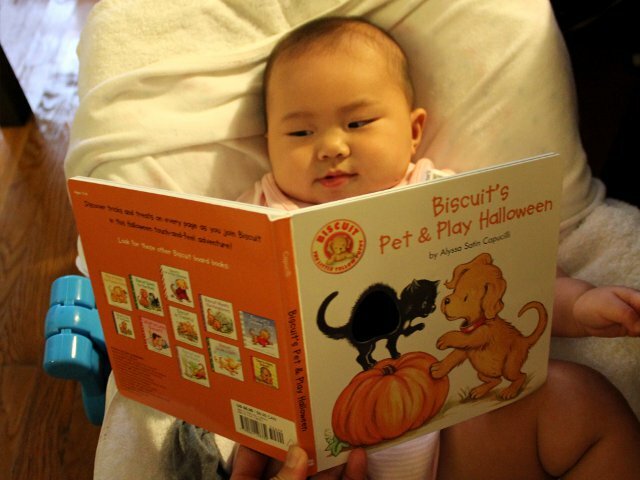 Biscuit’s Pet and Play Halloween is ideal for toddlers to read in October just before Halloween. Older school-age children will still enjoy the book, but the touch-and-feel aspect will be less interesting for kids of kindergarten age. Babies will love playing with the textures at all times. The double-reinforced page design makes the book safe to leave with even the youngest babies. Biscuit’s Pet and Play Halloween costs (including shipping) under $7 new and under $4 used from Amazon.